"The all-new adventures of the English Lord with the soul of an Indian." 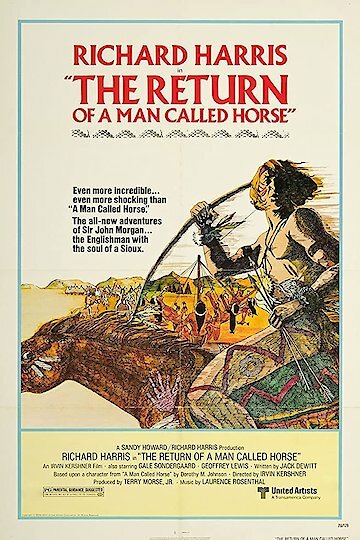 This film is about an aristocratic Englishman, played by actor Richard Harris, who was adopted by the Sioux Indians as one of theirs in the previous film, A Man Called Horse. He returns from England to assist his "family" who are being forced off their lands and killed by trappers. Facing complete obliteration, these Indians wait for the gods to assist them but their benefactor shows them that it may be in their best interest to fight back. This 1976 classic movie is followed by its equally captivating sequel, The Triumph of a Man Called Horse. The Return of a Man Called Horse is currently available to watch and stream, buy on demand at Amazon, Vudu, iTunes online.